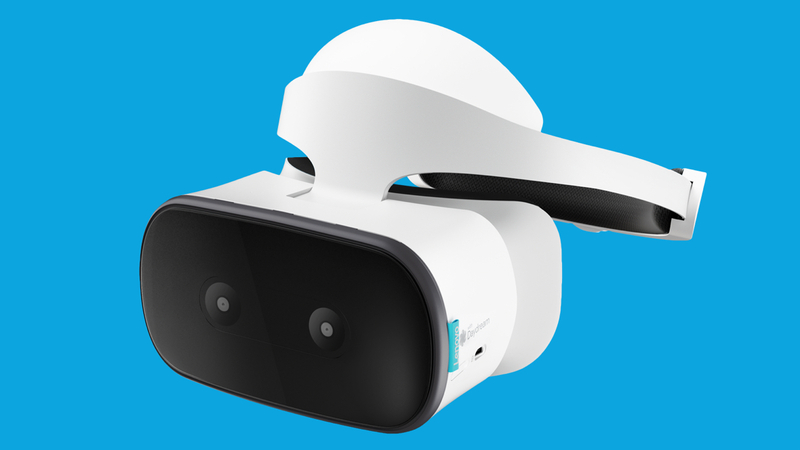 Not to have it confused with the Mirage AR headset, Lenovo has announced the Mirage Solo, our first standalone Daydream VR system. Unlike most other cable-free VR headsets, the Mirage Solo has its display built in so you won't need to slide in a smartphone; everything comes in the box. Also unlike other smartphone VR headsets, the Mirage Solo uses Google's positional tracking WorldSense technology, which means it can track your head without the need of any external sensors, and there's a 3 DoF controller to use with it too. The headset has a 2560 x 1440 resolution, which should prove pretty sharp, and a 110-degree field of view, which is a bit wider than the Samsung Gear VR but not quite as much as the HTC Vive. Other than being standalone, the Mirage Solo's other big selling point is that it's the first all-in-one to run on Google's Daydream. This means it will be able to run all of the games and apps on the Daydream store, which until now has only been running on Android smartphones. There's added focus on Lenovo too after HTC, which was set to launch its own standalone headset, the Vive Focus, changed course and decided to keep its headset exclusively for China. The Mirage Solo will cost below $400 when it goes on sale in Q2, though an exact price is yet to be confirmed. Initially Lenovo told us it would cost $450 but clearly realized this was too steep - that's higher than the price of the Oculus Rift - and has adjusted course. Granted, it has the benefit of not requiring a PC, console or even smartphone to run on, but Daydream is more lacking in the games department. It will also be going head-to-head with the Oculus Go later in the year, as well as Pico's own Goblin headset. So Lenovo has to be smart about pricing here. But that's not all. Lenovo is also launching the Mirage Camera, a VR shooter with dual 13-megapixel fisheye lenses and a 180 x 180 field of view. The camera, also built in partnership with Google, is designed to make it easy to shoot VR photos and videos. Video capture runs up to 4K at 30fps and all of them can be viewed back in 2D, but run them through a VR headset and you'll be able to experience them in stereoscopic mode. You can upload footage directly to YouTube VR using the camera's built-in Wi-Fi and even pair it to your smartphone and turn your phone screen into a viewfinder. There will be both Wi-Fi and LTE versions of the camera available, with the former "under $300" and set to go on sale at the start of Q2.